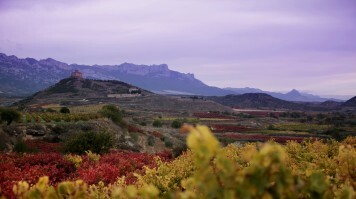 Rioja is synonymous to wine in Spain. The proud product of Rioja wine region, the famous wine usually accompanies Spain’s culinary offerings — think tapas. 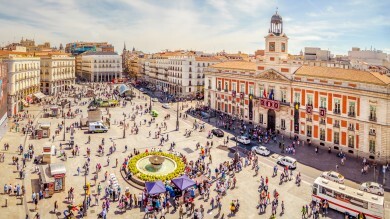 So, when in Spain, it is only fair to get to know Spain’s wine capital. Located in northern Spain, Rioja wine region is a school of wine making, even boasting a museum dedicated to wine and its relationship with man. When here, learn how a blend of Tempranillo and Garnacha grapes end up becoming a glass of rich, bright, and aromatic rioja. Spend your days hopping from one bodega to another, explore the wine towns, marvel at the architecture, and sip some delicious wines in between. If authenticity is what you’re after, Bodega Muga is the spot. This winery is located in the Barrio de la Estación (Railway Station District) in the charming wine town of Haro. Created in 1932 by a husband and wife duo, Muga is over 85 years old. However, the stone and oak building in which it’s housed is 200 years old! Muga is one of the only wineries in the country with its own “Cubero” — a person who specializes in the oak barrels in which the wine is fermented, aged, and stored. Muga also follows a traditional method during the clarification process that involves using egg whites to remove sediment from the wine. Tour the vineyards, enjoy a guided tour, educate yourself with a wine tasting course, or splurge on a Segway tour of the grounds! If you want to see the vineyards in their entirety, then hot air balloon rides are available, too! This winery claims to have the region’s most modern facility, although it’s also one of the oldest in the Rioja wine region. Established in 1858, Marqués de Riscal has been a national and international cornerstone in the winemaking business for 160 years, producing some of the best riojas. 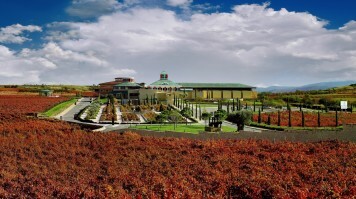 The modernity claim is thanks to the famous City of Wine complex built directly on its grounds. Completed in 2006, this ambitious project is the brainchild of Canadian architect Frank O. Gehry. It encompasses a hotel, spa, Michelin Star restaurant, and the oldest wine cellar in Marqués de Riscal, dating back to 1858. The location in the middle of the sprawling vineyards creates a magical experience for any wine-enthusiast. Tour duration: 90 minutes. Private tours are available for groups of 10 – 25 and last 2.5 hours. Reservations are necessary for any visit. Located in Briones, Rioja, a visit to Vivanco winery is one of the most comprehensive experiences any wine lover can have. Consisting of Museum of Wine Culture, the best of its kind in the world and an exhibition — The Garden of Bacchus — of over 220 varieties of grape vines, Vivanco is more than a winery. Even as a winery, it stands out amongst its contemporaries, using three unique aspects to ensure their wines are one of a kind. Firstly, the winery uses cold maceration — a cooling process the grapes undergo to gently extract the most color and aroma. Secondly, they use gravity-fed vatting, which ensures the grapes are not damaged and retain their skin during the selection process. Additionally, the use of French oak barrels during fermentation develops the wine’s taste, texture, and expression. Your visit here is sure to blow your mind! Opening hours: Vivanco experience (the wine tours) are conducted daily at 11:00 and include the tasting of four wines. Museum hours vary depending on the day, but typically is open between 10:00 – 18:00 daily. Closed on Mondays. Tour duration: The experience lasts 2 hours and vary from simple tastings, to combination tours of pairings, tapas, tastings, and guided museum and winery tours. Located in Haro, this winery has been around for 140 years and is one of the oldest in the Rioja wine region. Lopez de Heredia boasts four separate vineyards. The most famous is the Viña Tondonia, created over a century ago along the picturesque banks of the Ebro River. This is the vineyard that produces the most exquisite white wine that has made this bodega famous. The 10-meter deep wine cellars that span over 3,000 square meters and the bordeaux barrels in which the wine is stored are two main factors in this winery’s success. This is a small, cozy winery that cannot accommodate big groups. If you’re looking for a more intimate experience in the Rioja Wine Region, Lopez de Heredia is it. Opening hours: Monday to Saturday (10:00 – 19:00). Closed on Sundays. Tour duration: 2 hours for winery tour and tasting. Reservations are mandatory. Vineyard tours are conducted only on Saturdays at 10:30 and last 2.5 hours. Sleek and ultra-modern, Baigorri Winery is a far cry away from Muga or Lopez de Heredia. However, the glass box perched atop the hillside produces some of the best Riojas wines. There are several reasons for the design of this winery. First, most of the process actually takes place underground. The structure reaches seven stories deep and uses only gravity to move the grapes. There’s no machinery. Second, the mostly-glass building was designed to blend in with the surrounding environment while providing spectacular panoramas of the vineyards below. And third, the construction of the building allows visitors to stand in the center and watch the entire wine-making process take place around them. Enticed yet? The peak summer months of July and August attract crowds, so avoid these months if possible. May and June are the best months to beat the crowds and enjoy warm, dry weather. September and October are also lovely months to visit because this is harvest time and the vineyards are at their lushest. By car: It’s 340km north from the capital. The drive is about 3.5 hours and is mostly a straight shot from Madrid. By bus: Buses to Rioja leave directly from the airport in Madrid or the Avenida de America Station. 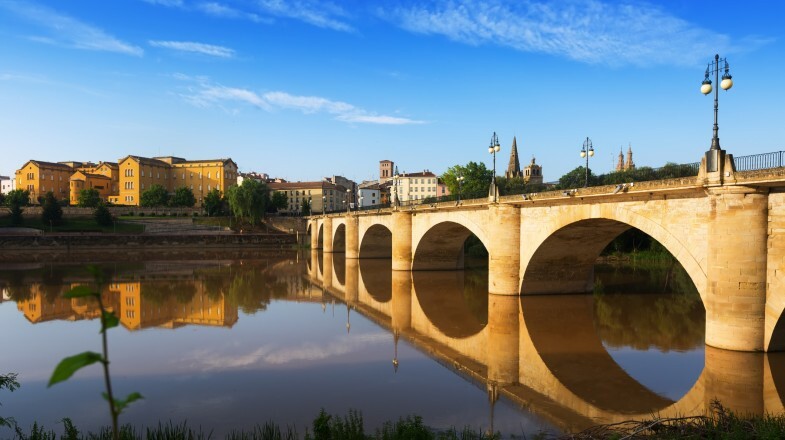 Bus rides take about 4 hours and drops passengers in Logroño, the self-proclaimed capital of Rioja. By train: There are two train lines running between Madrid and Rioja. The ALVIA train is direct and will get you there in 3.5 hours. There are also indirect lines with both ALVIA and AVE take anywhere from 4 to 4.5 hours and drop passengers in Haro and Logroño respectively. The accommodation offers cozy one-bedroom apartments equipped with full kitchen, living room, TV, and free Wi-Fi for just USD 45* per night. Located just 100 meters from downtown Haro, this is suitable for couples or friends looking for a great time in Rioja. A 3-star hotel just 3 kilometers from the center of Haro, the 17th century stone building is uber-charming and also welcome visitors to enjoy their small on-site spa with sauna and hot tub (extra charge). Rooms are comfortable, modern, and are equipped with kettles, A/C, and flat screen TV. Bicycle rentals are available on-site. A night costs around USD 115*. Remember when we mentioned the hotel in this winery? You can stay right in the thick of it for a price. At USD 615* a night, this is most definitely a splurge, but you get what you pay for here. The rooms are all unique, offering quirky window seats with views of the building’s fascinating architecture and the vineyards below. They also boast black marble bathrooms and minibars. Hotel amenities include an onsite spa, two restaurants, swimming pool, and a terraced, roof top lounge and wine bar. Nearly every winery or vineyard tour requires a reservation. Be sure to book in advance, especially if you visit in the summer season of July and August. All wineries charge a fee for the tours, tastings, and experiences. Prices vary quite a bit depending on the type of tour and the winery itself. 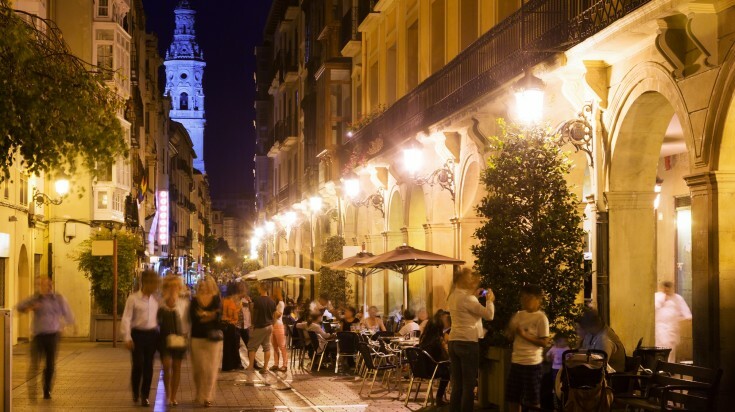 Logroño is the biggest city in the area and the capital of the region with 150,000 people. It has the highest concentrations of hotels and an active nightlife. Haro is nearly 50 kilometers northwest with a more quiet and relaxed setting. It’s known as the unofficial capital of the wine region. There are many wineries nearby. 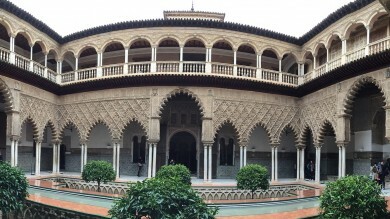 Multiday tours are available from Madrid up to the Rioja region. These trips include winery tours, high-end accommodation, and dining in first-class restaurants. Whether you choose to travel in luxury or on a budget, visit the most modern wineries or experience the most historic establishments, Rioja Wine Region will not disappoint. From cutting edge technology to traditional wine-making customs, Rioja instantly charms while simultaneously educating on the significant impact it’s had in northern Spain.